Note: This is an abbreviated version of a piece appearing in the Autumn/Winter 2016 issue of the NAGC Bulletin. Many thanks for their permission to share it here. A copy of the complete article is available through inter-library loan from the numerous public and art museum libraries which subscribe to this journal, (including the Rakow Library at The Corning Museum of Glass). The Bulletin can also be obtained directly from its publisher, the National American Glass Club. 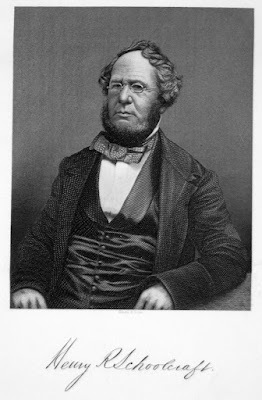 In the final years of the 1700s, a third generation family that was living in New York’s Hudson River Valley welcomed a new son, Henry Rowe Schoolcraft (1793-1864). They welcomed him into a newly formed country, brimming with promise and expectation, the United States of America. His father was the superintendant of a new window glass factory near Albany. The family boasted a long line of military men, but perhaps more importantly, a long line of adaptable, self-motivated, life-long learners and young Henry was no exception. With the help of his father and like-minded family friends, Henry parlayed a rural education into private instruction in Latin, a premier collection of scientific books, and a museum quality mineral collection. In 1809, at the age of 16, he started a hand-written literary magazine called “The Cricket” in which he published short pieces of prose and poetry among a circle of friends. His time at Union College was cut short by the opportunity to manage a glass factory further west on the shores of Seneca Lake, near Geneva, New York. Along with his father, Henry went on to become one of the most sought after glass factory guru’s in New England. In 1814, he was running the Vermont Glassworks on the shore of Lake Dunmore. He had set up an experimental furnace with Prof. Frederick Hall from the college in nearby Middlebury. Henry used the facility to research glass composition for a hefty book he was writing on the subject. Managing by day, experimenting by night, he still found time for his literary pursuits. It was here, in the autumn of 1814, that he composed a remarkable poem titled “Glass” in which he compares commonplace personalities of the early 19th century to the vitreous material of which he was so familiar. As frail, as brittle, and as keen a ware. Similitude in beauty, use and kind. By rays of light, than rays of intellect. Forbodes the public faith, a sudden death. Are all disclosed as clear as limpid quartz. To lash, report, or advocate a bill. But ever loudest, when they shuffle most. If raising troops, he votes with general glum. The exact manuscript title as written by Schoolcraft is: GLASS, | A Satire Poem. | Lake Dumnore, 1814. (4) Estimed: Vernacular loanword from the French, estime; valued. (10) “Feet of clay” is an expression referring to a weakness or character flaw. The phrase derives from the interpretation of the dream of Nebuchadnezzar, King of Babylon, by the prophet Daniel as recounted in the “Book of Daniel.” (Daniel 2:31–33, 2:41–43). (21) Phthisic: a wasting illness of the lungs, such as asthma or tuberculosis; phthisis. Any wasting disease. A person suffering from phthisis. (23) Felon: a carbuncle or other localized infection of the skin. Fire warts: “The hand that reached farthest down on the shovel is burned forever with calloused fire warts.” William E. Bain, Frisco Folks: Stories and Pictures of the Great Steam Days of the Frisco Road (St. Louis-San Francisco Railway Company) (Denver: Sage Books, 1961), p. 96. (25) In the ms, “Graced” is struck out and replaced by a word that is smeared and illegible to me. (27) Nostrum: a medicine, especially one that is not considered effective, prepared by an unqualified person. (31) Blaberius: possible Latinization for ‘one who blabbers’. Also blaberus: a genus of giant Central American cockroach. (35) Prate: to talk foolishly or tediously about something. (37) Witherspoon: John Knox Witherspoon (1723–1794). Paul Engle, “Glass, A Poem by Henry Schoolcraft” in Glass Club Bulletin, of The National American Glass Club, No. 230, Autumn/Winter 2016, pp. 5-14.